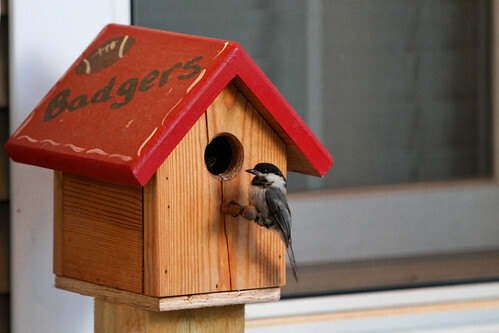 There is a family of chickadees that moved into the Badger Birdhouse on our front porch, and a sat in a chair waiting for this little guy to come back home. He was a bit skeptical of the softbox, and took a bit for him/her to get enough courage to fly back home. Image captured with a 7D and 70-200mm lens, pocket wizard and a 430EX II in a softbox. I'm thinking I'll need to set up a camera to capture the chicks inside before they get too big.